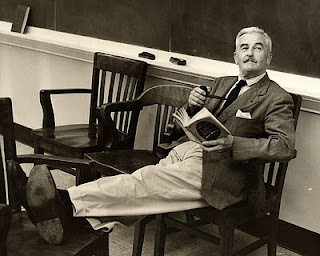 "In December, 1957, getting ready to begin his second Spring semester at the University of Virginia, Faulkner joked in a letter that he was "just the writer-in-residence, not the speaker-in-residence." He certainly wrote while he was here, including much of The Mansion, but did more than enough speaking to earn that second title. Between February and June, 1957, and February and May, 1958, at thirty-six different public events, he gave two addresses, read a dozen times from eight of his works, and answered over 1400 questions from audiences made up of various groups, ranging from UVA students and faculty to interested local citizens. Most of those sessions were recorded on the advanced technology of that time – the reel-to-reel tape recorder. In this archive you can hear 1690 minutes (over 28 hours) of those recordings."